Sawn Timber : Swedish Whitewood Sawn Carcassing Timber. Swedish Whitewood Sawn Carcassing Timber. Our stock of Swedish Whitewood Sawn Timber is Kiln Dried (KD) and Dry Graded to C16/C24 Standard. This quality or grade is commonly used for general building applications such as joists, beams, rafters, stud partition walls and battens. 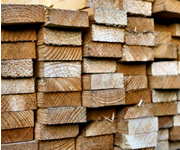 The timber is stocked in certain standard lengths and widths that suit most common requirements. As well as the sawn finished stock we also keep some sizes of CLS (Canadian Lumber Standard) timber, planed all round with eased corners, ideal for stud partition construction where regular sizes are critical for dimensional accuracy. Longer Length and or Higher Graded Timbers can be supplied. Please enquire. Stud Partition Construction and General Timber Framing. We offer a machining service to Resaw standard stock sizes to customers non-standard dimensions. Timber orders can also be treated as needed for specific demands such as Roofing Timbers, Decking or Fencing and ground contact timbers. Click the link on the right of this page to view our stock sizes.